Deborah and Todd Lovell complete their training at PAIRS Instructors. 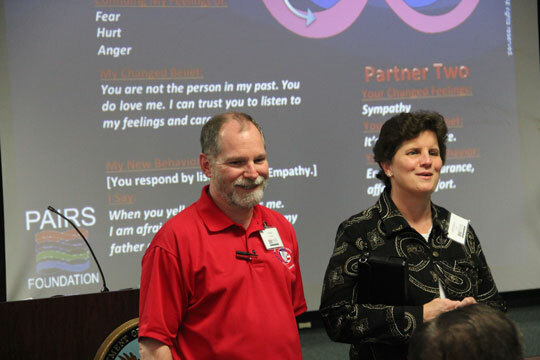 The couple today lead marriage retreats for visually-impaired Veterans and their spouses at the Charlie Norwood VA Medical Center in Augusta, Georgia. In August 2011, the Charlie Norwood VA Medical Center in Augusta, Ga., held its very first marriage retreat for blind and visually impaired Veterans and their spouses. One of the instructors at that groundbreaking event was Deborah Lovell, a counselor at the medical center’s Blind Rehabilitation Center who is blind herself. Together with her husband, Todd, Lovell was trained to lead marriage retreats by the nonprofit PAIRS Foundation. Eleven couples attended the first retreat for visually-impaired Veterans at the Charlie Norwood VA Medical Center. Lovell said some of the communication skills she teaches at the marriage retreats have actually been useful in her own relationship. “My husband and I communicate pretty well, but there’s always room for improvement,” she laughed. “For example, there’s a technique we teach called ‘The Daily Temperature Reading,’ or DTR for short. It’s where a couple sets aside a few minutes each day to talk to each other, face to face, about whatever’s on their mind. They share their thoughts and feelings about something. They listen to each other.